Prior to 2016, most people would have passed Calf Top without giving this unassuming peak a second glance. Barely distinguishable as part of the crest above Middleton Fell, it lies on the route of a pleasant ridge walk above the lovely side valley of Barbondale, south-west of Dent village. All this changed, however, when Calf Top made national headlines after a recalculation of its height determined that it deserved ‘mountain’ status, measuring in at just over 609m tall – the all-important 2,000 feet. 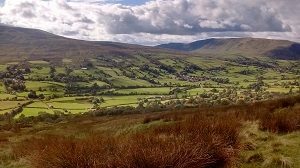 This news coincided with the expansion of the Yorkshire Dales National Park boundary in August 2016 to take in the Middleton massif, along with the handsome Howgill range to the north. The ancient rocks underlying this area have long fascinated academics and Dent-born Adam Sedgwick (1785-1873) was instrumental in founding the modern science of geology, identifying the Dent Fault running through here. This complex geological history is explored along the Sedgwick Trail, near Sedbergh, created in 1985 to mark the bi-centenary of the geologist’s birth.